Thymes Frasier Fir Statement Collection Tree Candle sets the mood with modern luxury and the aromatic snap of Siberian Fir needles, heartening cedarwood and earthy sandalwood. Thymes Frasier Fir evokes the warmth and comfort of the holiday season. When lit, it creates a beautifully rich ambiance accented by a real wood lid. 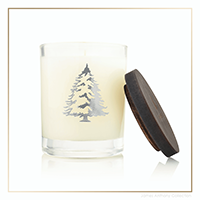 Thymes Frasier Fir Statement Collection Tree Candle sets the mood with classic holiday luxury and the scent of Frasier Fir. Part of the Thymes PLANT ONE TREE Program. for every product sold, a tree will be planted, creating a heartfelt gift to give or receive.